Instantaneous relay with high contact rating. Recommended operating position : vertical coil axle/clapper upside or horizontal coil axle/contacts down. Pluggable on front wiring socket (EVD) or rear wiring sockets (ER, ERB, ERDL). 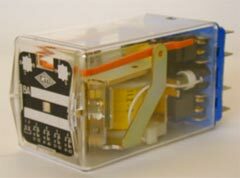 This relay is equipped with 5 double cut-off CO contacts with self arc blowing, particularly adapted to high DC cut-off. Min. nominal voltage AC 220 V 380 V - 50/60 Hz.